This introduction to Spanish develops the five C's of the national foreign language standards using instruction that follows a spiral approach, gradually increasing the level of difficulty for maximum stimulation with ease of learning. The materials are divided into three steps and are designed for two 15-minute lessons per week. Exposure to Spanish begins with theme-related words and builds in complexity. Each step provides a broader vocabulary base and more advanced structures while also reviewing concepts from previous steps. 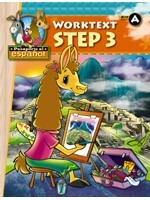 Kit includes a Teacher's Edition for teaching 3 levels of Spanish, including 64 theme lessons per step which combine listening, speaking, reading, and writing, a teaching puppet, teaching charts--9"x12" with songs, Bible verses, vocabulary, and more, read-aloud books, an audio CD set with recordings of native speakers, student worktext with age appropriate activities; 1 page per week, and more! Grades 1-6.